Gary Unmarried good sign for season two? Part of CBS’ Wednesday night sitcom experiment, Gary Unmarried remains firmly “on the bubble” for renewal. The show hasn’t exactly been a stellar performer but it’s still done pretty well, especially considering its competition. 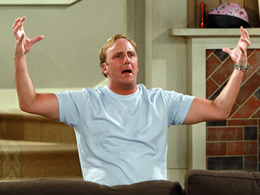 Gary Unmarried stars comedian Jay Mohr as a newly-divorced dad who’s readjusting to the single life. Others in the cast include Paula Marshall, Jaime King, Ed Begley Jr., Ryan Malgarini, Kathryn Newton, and Al Madrigal. While CBS execs are thinking about whether or not to give the sitcom a second season, there’s a big change going on behind the scenes. Creator/executive producer Ed Yeager and executive producer Ric Swartzlander have left the show due to creative differences with the network. If Gary is renewed, it’s expected that co-executive producer Ira Ungerleider and consulting producer Rob Des Hotel will be moved up to showrunners. The change in staff may be good news for the sitcom. If the network was unhappy with the direction of the series, execs might be willing to give it a second try with new writers in the driver’s seat. CBS’ new schedule will be announced on Wednesday in New York. Gary’s final episode of the season (or series) will air that night. Season 2 is definitely improving on season 1 (season 1 was good) I think the women playing his boss is fantastic love her and his new job at the radio adds more to the show. This show is getting better and better and definitely is worth keeping on air its funny, sweet and obviously Jay is superb what an amazing actor!!! “Gary Unmarried” is such a funny show. It is a brutally honest show. Watch this show just one time and you’ll be hooked.